I love poached chicken, the meat is so juicy and tender. That is why I love Hainanese Chicken rice. 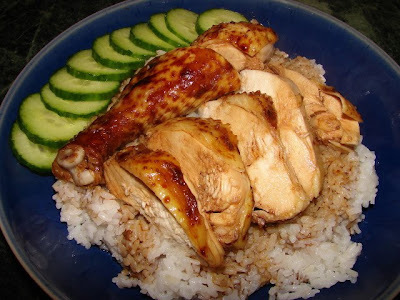 Another of my favourite is soy sauce chicken (See Yau Gai 豉油雞). This poaching liquor is a mixture of light soy, dark soy, sugar and spices normally referred to as master sauce (lu sui 鹵水). Chicken poached with this sauce is a lot more flavourful than just poaching with water or plain stock like Hainanese chicken. I normally poach a whole chicken, if you like you can also use chicken pieces. Quite a simple recipe, to poach one whole chicken the essential tool is a large pot which can fit the whole chicken in with a bit more extra room. Next is to get a flavourful plump chicken preferably free range, organic or corn feed. Night before (or 24 hours before) you are ready to make this poached chicken rub the chicken (1 whole chicken) with about 1 tbsp salt , 4 - 5 tbsp light soy and 1 tbsp sugar. Keep the chicken in a zip lock bag with the marinade and leave in the fridge overnight. The flavour will penetrate the meat inside and also tenderise the chicken making it very juicy. Before you are ready to poach the chicken take it out at least one hour before to warm to room temp. Then put the chicken in a pot of rapidly boiling water and blanch at low heat for 2 - 3 minutes, this will reduce impurities oozing out into the master sauce. Discard the water and rinse chicken if there are impurities sticking on the body. You can blanch the chicken while the master sauce is simmering. If you are not too worry about impurities in the master sauce you can skip the blanching. I skip this step when I feel lazy. Here is how to make a pot of master sauce or lu sui 鹵水. This sauce is re-usable again and again. There are restaurants or families who have kept lu sui going for years and years. To reuse just top up with any ingredients needed. The longer you use it the more complex the flavour will become. This sauce is so flavourful after a few poaching with meat, great as a sauce just drizzle on rice or any noodles. Other than chicken you can use lu sui to poach any meat you like or hard boiled eggs and firm tofu. It is best to keep at least 2 different lu sui, one for lighter flavoured meat and the other for stronger flavoured meat. Lighter flavoured meat like chicken and pork also use the same for eggs and tofu. Stronger meat flavoured meat like duck, beef, lamb and offals. a. Make a caramel - Caramel gives a reddish brown colour to the meat, better than just using dark soy sauce. Put 1/3 cup of plain sugar and 4 tbsp of water in a small sauce pan. Heat till sugar has completely dissolved into a clear liquid. Continue cooking till the sugar beginning to turn yellow, heat turned to minimum and gently heat till the sugar has turned medium golden brownish red (a touch darker than golden syrup) heat off immediately. You need to watch this very closely, 1 or 2 seconds late the sugar can get too dark and tastes bitter. The syrup will continue to darken a bit more, when you see the colour has turned a nice reddish brown colour, gently pour in a little water (best use boiling water). the sugar will boil rapidly. Then a bit more water and stir, continue doing this till syrup stops bubbling, then pour in more water. Total water added is about 1 cup water or a bit more does not really matter. If any sugar did not dissolve at the bottom of the pan, turn the heat back on and heat till dissolved. You can wrap all the spices with a muslin clothe before adding to the pot but I never bothered. Put all the ingredients in a large pot and let that come to the boil then lid on and simmer for 15 - 20 minutes. Now this sauce is ready for poaching chicken or other stuff. Have a taste, if you like it saltier can add more soy (light or dark for colour too) or simply add a little bit salt. If you like sweeter, add a little bit more rock sugar. Let the lu Sui come to a rapid boil. The sauce should be just over 1/2 full, any more or you may have an overflow when your put the chicken in. Lower the chicken in (blanched or raw). The chicken must be totally submerged in the sauce, if not enough liquid add a bit more water with or without some more soy sauce. If too much sauce remove some. Lid on and let it simmer for about 10 - 12 minutes or till the temp. of the sauce has reached about 82 - 85 deg C. Heat off, lid on. Cover the pot with some clean large towel or blanket (keep the pot away from the stove in case you set the towel or blanket on fire if you coincidently turn the heat on), covering with towel or blanket is to preserve the heat especially making this in the winter or cold kitchen (or put the pot in a polystyrene cool box). Let this sit for about 40 minutes for a medium size chicken, longer if the chicken is large. The chicken will be cooked but may have a little redness near the bone, some people like it this way because it is very juicy and tender. If you like the chicken completely cooked through without any redness at all, remove the towel, put the pot back on the heat and simmer very gently for about 10 minutes. Heat off and leave it for another 15 minutes or so. By then the whole chicken should be thoroughly cooked through and still juicy. Take the chicken out and let it cool before cutting. Serve Chicken with rice or noodles (wheat or rice noodles), pour on some of the flavourful poaching sauce. Can add steamed green vegetables or few slices of cucumber or lightly blanched bean sprouts. If you like spicy have some chilli oil, homemade ginger chilli sauce (see this post) for dipping. Strain any leftover master sauce with muslin cloth or a very fine sieve to remove any impurities and spices. If the sauce has thickened (gelatinous), warm before straining. Then briefly boil this till boiling. Heat off and let it cool completely. Then pour into container or plastic bag and freeze till you are ready to use again. Can also keep in the fridge up to 10 days before using again. If there is a lot of fat on the sauce, put this in the fridge overnight, remove the fat then freeze. To reuse, top the sauce with more water and any of the ingredients you feel is lacking. Keep this going you will have a complex flavoured matured master sauce that is treasured by many people. Thanks for a very detailed step by step guide to making this Master Sauce. Ihave heard of this Master Sauce but never knew how to make it. I usually buy the sauce commercially bottled which come by the name of Chicken Marinade! Now I can do this sauce at home and genuinely call it Home Made Chicken marinade. Thanks once again for sharing ur expertise! 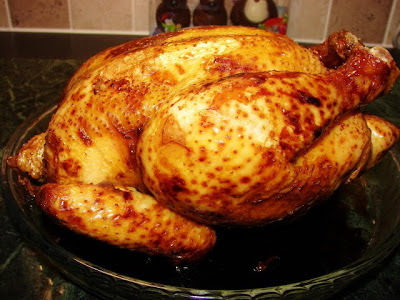 Delicious chicken recipe and extremely well explained. Thanks for this — I've had it bookmarked since you posted it and just tried it out tonight. I poached some chicken breasts for a salad with vermicelli and mushrooms, and it worked a treat. Looking forward to seeing how the flavour develops as I use it more.